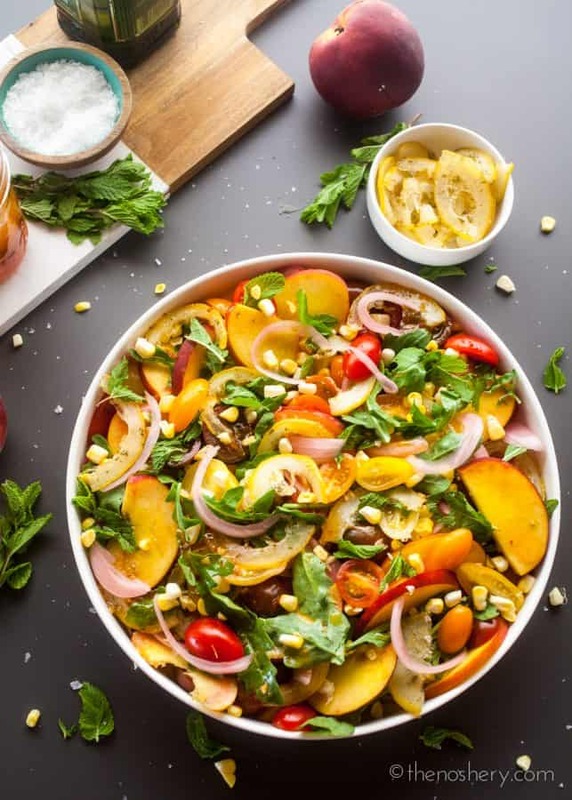 Candied Lemon Peach and Tomato Salad | Some days all I crave is a big salad but, then at the same time the idea of a big bowl of greens sounds so boring. I have this weird love-hate relationship with salad. I found that it has a lot to do with salad greens. If the salad greens are sad, too grassy, or iceberg I will turn my nose up at a salad in a hot second. I am so picky about salads I rarely order a salad when eating out. A salad is so much more than just greens, tomatoes, cucumber, and onions. My basic philosophy is if it grows together it goes together. There is no better guide to combination then the seasons. Food that grows during the same seasons is sure to pair well together. 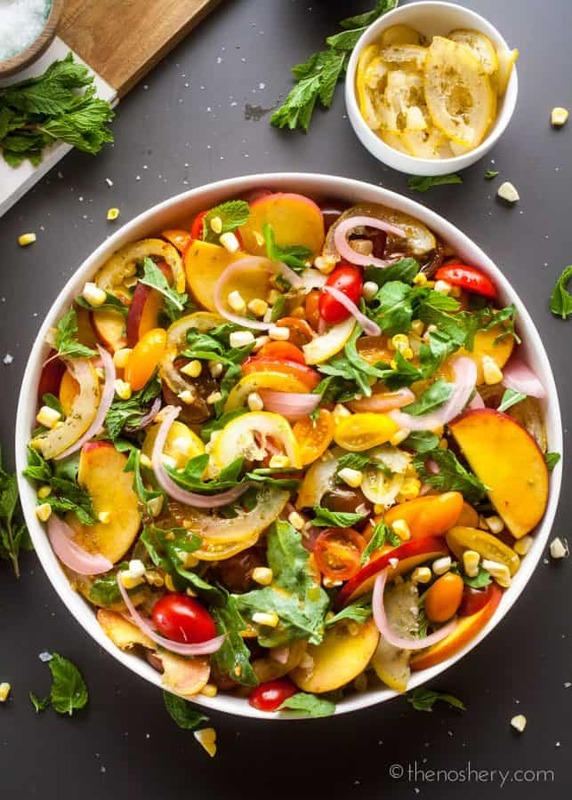 Using that philosophy as my guide I created this salad with peaches, tomatoes, corn, and lemons. These are all in season during the summer and make a wonderful salad combination. I knew I wanted to use peaches and lemon but, I wanted to do more than just a squeeze of lemon or a lemon dressing. So, I decided to candy slices of lemon to use as a fun salad topper. Candied lemon can be made ahead and make a great addition to any salad. I find medium or small lemons are best because they have a better rind, pith, to flesh ratio. The large lemons tend to have too much pith. Heat oven to 325 degrees. Line a sheet pan with parchment paper. Slice lemon 1/8 inch thick removing any seeds. Add lemon slices to a sauce pot. Add enough water to the pot to cover the lemon slices by 1-inch. Bring the lemons to a boil. Boil for 2 minutes. Drain lemons, spread out on a clean paper towel and pat dry. Transfer the lemon slices to a large bowl. Add sugar, a drizzle of oil, and any flavorings. Toss with lemon slices. Lay lemon slices in a single layer on prepared sheet pan. Roast in the oven for 15 – 20 minutes or until the slices look dry and lightly colored. Let completely cool. Use immediately or store in an airtight container on the counter. To balance out the sweetness of the candied lemon and peaches I decided to dress the salad with a spicy honey vinaigrette. It was a great choice! I balanced out the sweetness with a little heat without being too spicy. Then to add a touch of crunch I chose to use raw fresh corn. The only time of year I will even consider using raw fresh corn is during the summer at peak season. It has a great sweetness and crunch. I made this salad to take to a pool party and it was a huge hit. Even non-salad fans enjoyed it. It was perfect with grilled chicken as a full meal. 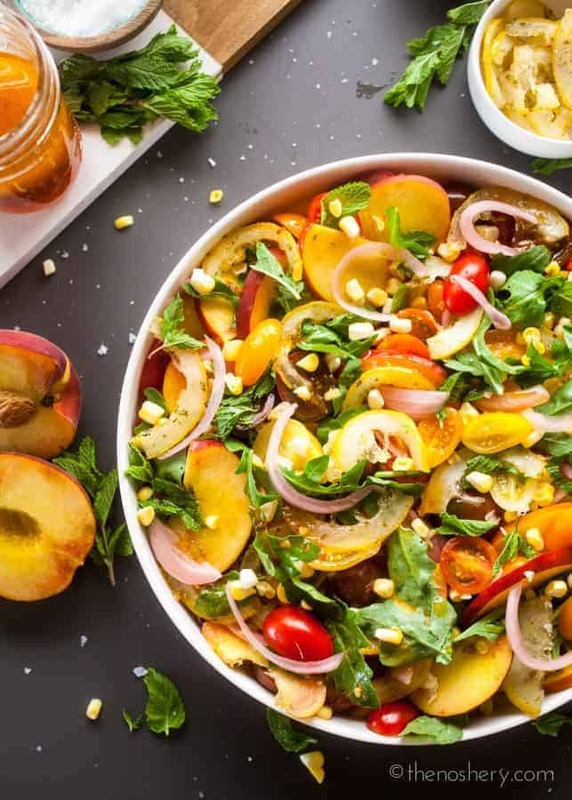 This salad with its candied lemon, ripe peaches, sweet tomatoes, and fresh corn is basically summer in a bowl. Make ahead a batch of candied lemon and your favorite salad can be ready at a moments notice. Are you looking for more salad inspiration? Check out my salad recipe collection! Candied lemon is edible from rind to flesh and is a great addition to any salad. 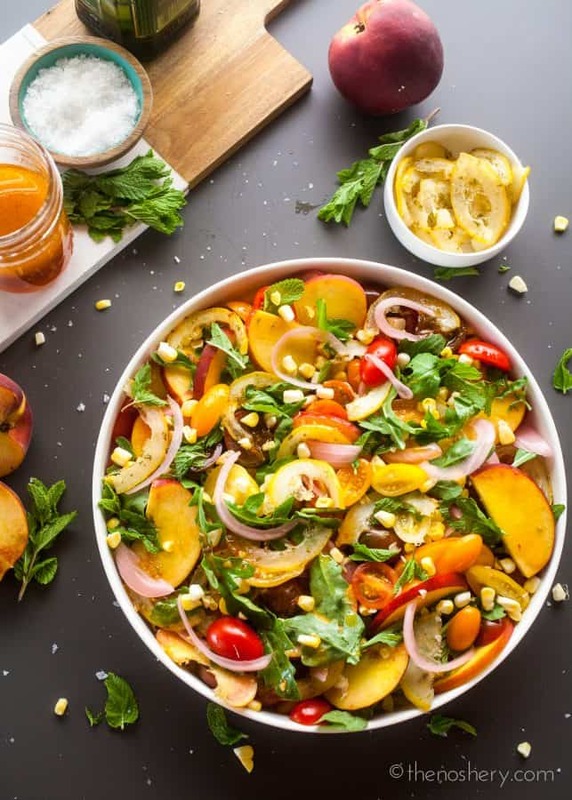 Candied lemon, mint, tomatoes, and peaches make this a perfect bright summer salad. Gently toss lemon slices with mint, sugar, and 1 tablespoon oil in a medium bowl. Spread out on a parchment-lined baking sheet and bake until lemons are no longer wet and only slightly colored, 15–20 minutes. Let cool. In a small bowl combine apple cider vinegar, shallot, garlic, hot sauce, honey, olive oil, chives, chili powder, and salt. Whisk until well combined and emulsified, add more hot sauce to taste if desired. Set aside. 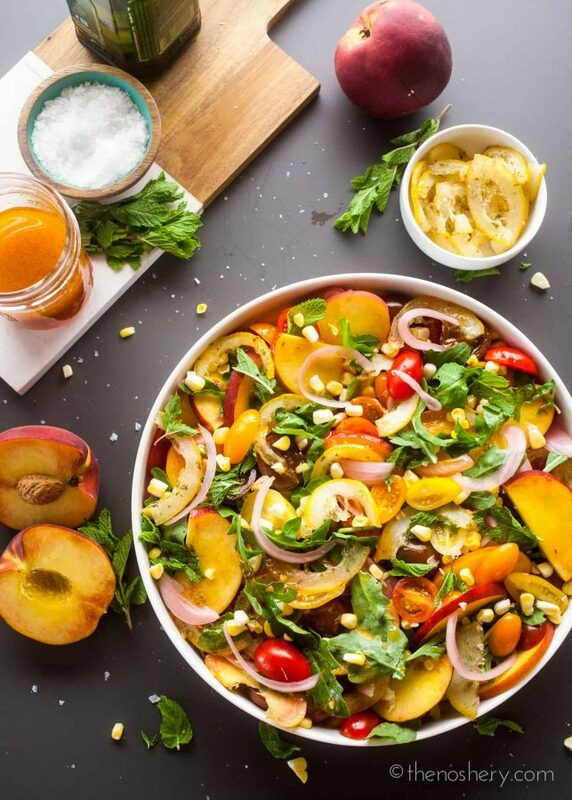 In a large shallow bowl combine tomato, peaches, red onions, arugula, and torn mint leaves. Top with candied lemon slices, drizzle with dressing and sprinkle with salt. Summer in a bowl, right here! I just love the pops of color in every bite of this salad! And those flavors… drooling! Wow, what a lovely flavor combo!